We’re busy planning our next events. If you have ideas for future workshops or events please let us know! Become a member and you’ll receive updates and invites too! Index, WA., April 25, 2018 – You Are Invited! Join us on April 25, 2018 at 5:30pm at The River House. The Index Historical Society is offering a Docent-led Historic Walking Tour followed by a Potluck and Program at The River House. Help us celebrate the 125th Anniversary of the Town of Index being put on the map AND receipt of a Snohomish County Heritage Projects Grant! 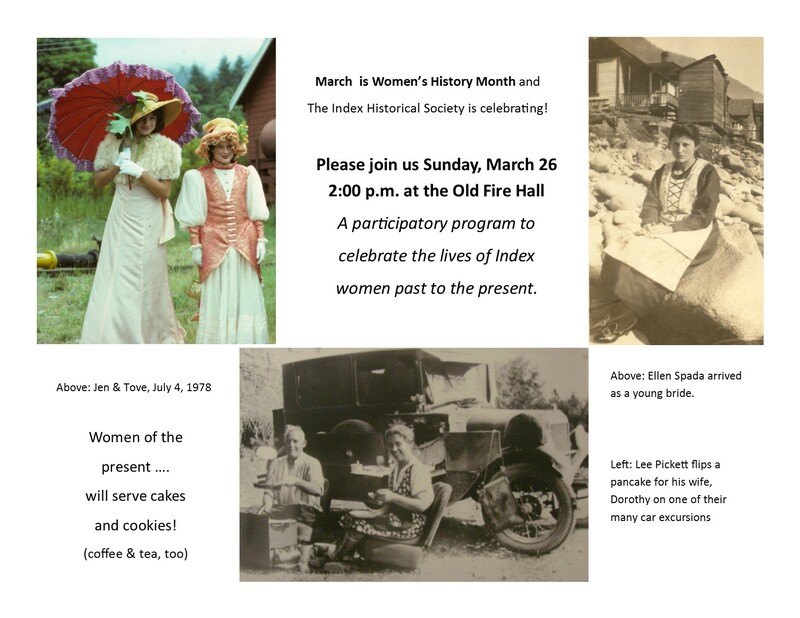 Index, WA., March 26, 2017 – The Index Historical Society invites you to join us for an interactive program featuring a slide presentation, a round-robin participation session, and lots of photos and stories — all enjoyed with treats and coffee or tea. 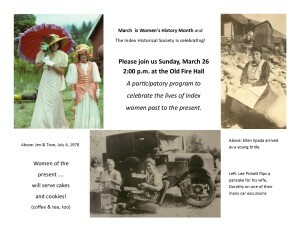 We look forward to sharing the lives of Index women past and present in a participatory program — please come! Men and children are also welcome. This free event will be held on March 26, 2017 at 2pm at the Old Fire Hall in Index, Washington. Parking available at the Index-Pickett Museum. Learn more and let us know you’re coming on our Facebook Events page. Everett, WA., August 17, 2016 – Want to learn more fun facts about Snohomish County heritage? Then grab your walking shoes, hop on a bike – or put the kids in the stroller and make your way down the Centennial Trail, September 10th from 11a.m. – 3p.m. 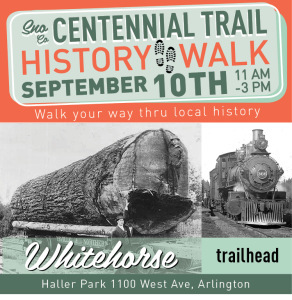 to learn local history along the former tribal route and early-century transportation corridor. The Snohomish County Historic Preservation Commission and local heritage organizations will offer activities for kids, hands-on interactive exhibits and a chance to touch historic artifacts at six different sites along the 30 miles of historic rail line and at Legion Park in Arlington. The event is free. Join the Index Historical Society for a fun and educational guided walking tour of the Town of Index, Washington. You’ll learn fun facts about the town’s history, visit sites that were an important part of Index’ past, and have the chance to ask questions from your expert tour guides. The walk is anticipated to be 45 minutes long (dress for the weather!) and is scheduled for 1pm and 4pm. Participants will receive a commemorative plat-map guide. This family-friendly activity is free for IHS members (all others $5 suggested donation). The Museum will open for special hours on this date; 12noon to 5pm. Come enjoy our unique collection of photos and artifacts! This activity coincides with the Bush House Inn’s Historic Photo Shoot – we hope you can make it to both events! Be sure to stop in at the Ellie and Clarence Gift Shop as well! Northwest Heritage Resources is pleased to present a concert performance of Songs of Labor History. The concert is presented in partnership with the Index Historical Society, and is scheduled for 7:00pm on Saturday, April 16, 2016 at the River House, 444 Avenue A, in Index. The concert will feature the talented duo, Rebel Voices. 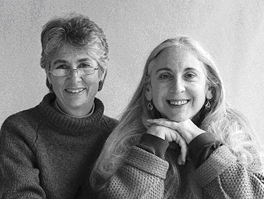 For over twenty years, Susan Lewis and Janet Stecher have created incredible harmony as members of The Belles of Hoboken, Shays’ Rebellion, and since 1989, Rebel Voices. They took their name from the book by Joyce Kornbluh, Rebel Voices: An IWW Anthology, a collection of writings, songs, poems, and cartoons by members of the Industrial Workers of the World. “Wobblies” have always been rabble rousers, unionists, artists, and singers who attack the issues of their time with passion and humor. This same spirit moves Rebel Voices today as they sing out for social and economic justice. With an integrated vision of theater, harmony and politics, Janet Stecher and Susan Lewis fill the stage with rare power and compassion. Suggested admission to the concert is a donation of $5.00, collected at the event. There will be no advance ticket sales. The April 16th concert is funded in part by the National Endowment for the Arts, 4Culture and Northwest Heritage Resources. Part of admission donations will go to support the Index Historical Society. 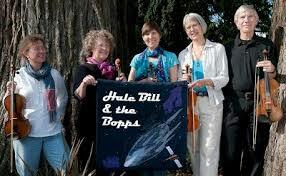 Northwest Heritage Resources is pleased to present a concert performance of traditional Nordic folk music by the very talented group Hale Bill & the Bopps. The concert is presented in partnership with the Index Historical Society, and is scheduled for 7:00pm on Saturday, March 5, 2016 at the River House, 444 Avenue A, in Index. Hale Bill & the Bopps, based in the Seattle-Tacoma area, offers a musical buffet of toe-tapping tunes from all the Nordic countries—get-down schottisches, lilting waltzes, captivating polskas, and much more–dished up on fiddles, keyboard, voice, and two uniquely Scandinavian traditional instruments, the nyckelharpa (Swedish), and Hardanger fiddle (Norway). The Bopps’ musicians have been part of the Pacific Northwest folk music scene since the 70’s and 80’s, performing primarily at folk dances and festivals. Suggested admission to the concert is a donation of $5.00, collected at the event. There will be no advance ticket sales. The March 5th concert is funded in part by the National Endowment for the Arts, 4Culture and Northwest Heritage Resources. Part of admission donations will go to support the Index Historical Society. LAKE FOREST PARK – October 21, 2013 – Northwest Heritage Resources is pleased to present a concert performance by world famous West African kora musician Foday Musa Suso in Index, WA. The concert is presented in partnership with the Index Historical Society and the Ethnic Heritage Council, and is scheduled for 7:00pm on Saturday, November 9, 2013 at the River House, 444 Avenue A. in Index. Foday Musa Suso comes from a traditional Mandinka griot family from Gambia in West Africa. His main instrument is the kora, a traditional West African twenty one string harp-lute. In the Mandinka tradition, the kora player is also a skilled singer, oral historian, geneologist and storyteller. In addition to performing the music of his West African homeland, Suso emigrated to Chicago in 1977 and has collaborated with many famous American jazz and classical musicians such as Bill Laswell, Philip Glass, Pharoah Sanders, Jack DeJohnette, Ginger Baker, Paul Simon and Kronos Quartet. Don’t miss this rare opportunity to hear a master West African musician! Suggested admission to the concert is a donation of $5.00, collected at the event. There will be no advance ticket sales. The November 9th concert is funded in part by the National Endowment for the Arts, ArtsWA (formerly the Washington State Arts Commission) and Northwest Heritage Resources. Most of admission donations will go to support the Index Historical Society and the rehabilitation of the Bush House Hotel. For more information call 206-306-1181 or 360-793-1534, or email: info@northwestheritageresources.org. Thank you for giving us this link to an exciting list of events for the Sky Valley. What activities do you have planned for 2017? I would like to bring a group there. When is Index Days?